I get my water bill every month and just pay it robotically. Am I alone? I feel like no. We are all busy parents (most of us in that “both parents work” category). I know I don’t have to tell you that a leak or flood could cost you your savings; here in NY with superstorm Sandy in the past the water line is always in my thoughts. Enter SimpleSENCE and I feel like my house has a little more control. This tiny little “the size of a computer mouse” sensor does so much! This is of course a leak sensor and temperature sensor (no more worries about bursting pipes)! It has an audible alarm that sounds off in the event of a leak or temperature issue. 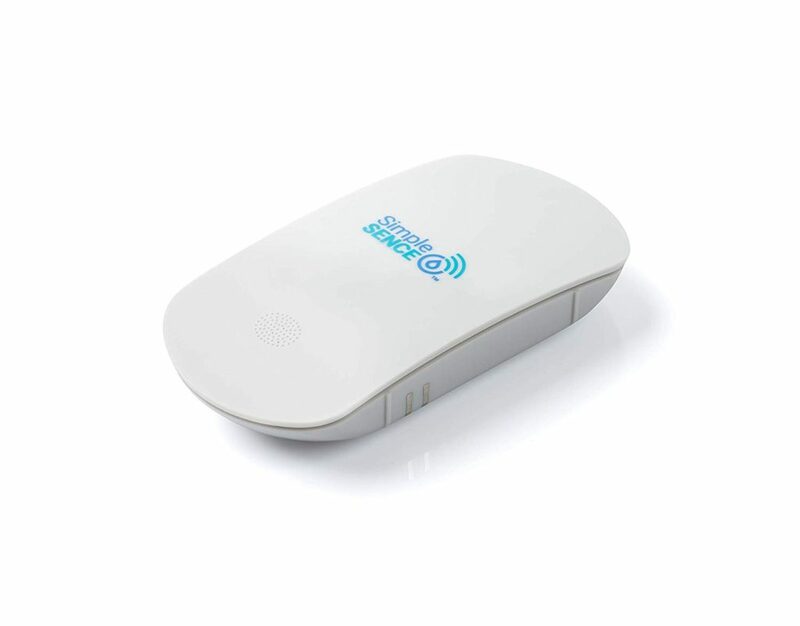 It will actually alert anyone in the house even if your phone is not nearby! What could be better than getting an instant alert when there is an issue/potential issue. Think vacation home – you rent the house but you just aren’t there. What could be better than this sensor that tells you what’s going on when you aren’t there. Talk about super protection for your investment! Think elderly family members – the basement is always the target of the flood and our “inlaws” and “grandparents” may not be able to get down to the basement. You would have peace of mind and not have to worry at all about damage to your property. You can buy multiple sensors for your home; think one in the kitchen (under the sink), one in the attic (near windows or even the HVAC unit), one by the laundry machines, one in the bathroom (near sink, tub or toilet), the basement (near windows or leak prone walls) or your garage. The are available on amazon so scooping them up is super easy! One sensor costs around $60 a 3 pack is around $170 while a 5 pack is around $280. Quite honestly one of the most responsible investments you may make. I found the sensor super easy to set up and use. Please consider making the investment for your home! Previous Article PLAY + DISPLAY! — Win a Set of Removable Frames for Your Favorite Vinyl Records – A $121 value!